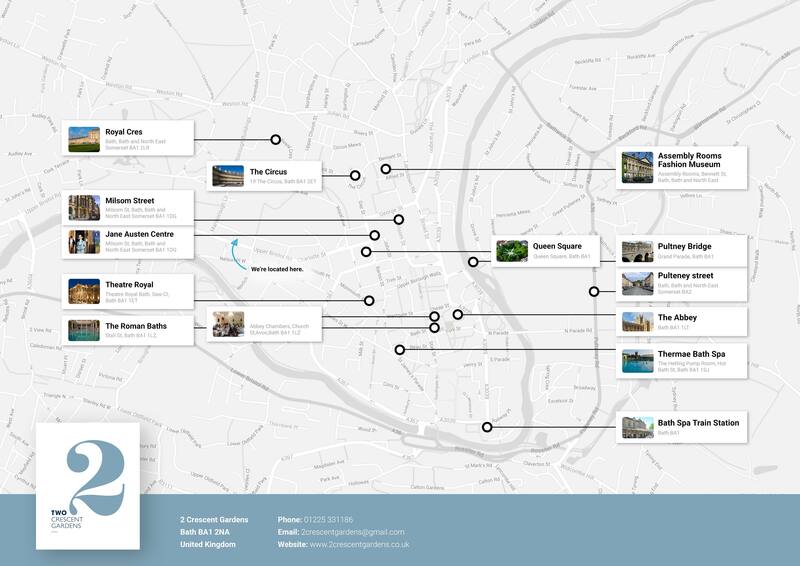 At 2 Crescent Gardens, the whole city is on your doorstep and there's lots to do for everyone. Here are a few things that we recommend. Bath is a compact city, which is ideal to walk around. Every day, there are complimentary walks led by the Mayor of Bath Honourary Guides helpers - walks last around two hours and are free of charge. You can also get your bearings on the hop on, hop off bus, which stops close by the guest house. The comedy walk is also very popular –we have leaflets for each of these attractions at the guest house. Bath has a wealth of independent shops. Milsom Street has been welcoming shoppers for hundreds of years and is home to Bath's famous Jolly's department store, plus there's stylish Milsom Place nearby. Trendy Walcot Street is full of independents and artisan traders, and you can find high street names at the Southgate shopping centre. For great coffee and lunches, head to Rosario's café in the city centre. Rosario takes great pride in the quality of his coffee and his café has a lovely atmosphere. Mention 2 Crescent Gardens and you'll receive 10% off your bill. Bath has a great choice of pubs and clubs. Whether you like a traditional pub or a modern bar. For a great authentic pub, try The Star Inn, which is a 15 minute walk from 2 Crescent Gardens: Close by the guest house, the Hop Pole, which also serves food, is owned by Bath Ales and has great beer. We would recommend a trip to the Thermae Spa where you can bathe in naturally heated spa water and book special treatments. If you visit on a weekday you can also avoid the crowds. No visit is complete to Bath without seeing the Roman Baths and Bath Abbey which are two great attractions next to each other. At the abbey, you can climb the steps to the top and get an amazing view of the city from the roof. There's also the 18th century Great Pulteney Street and Pulteney Bridge, which was modelled on the Ponte Vecchio in Florence. Bath has a range of museums and the wonderful Theatre Royal if you would like to see a production. We recommend the Holburn museum, with art and exhibitions where admission is free and there's also a lovely café. If you fancy a breath of fresh air, then there's plenty to do in Bath. Royal Victoria Park is just next to us and includes the beautiful botanic gardens.You could while away a few hours sailing along the river, wander around some 17th century gardens at the National Trust's Prior Park Gardens, or if you would like to stretch your legs then the Bath Skyline Walk – the National Trust's most downloaded walk. Around one hour away from Bath (by car) is the Neolithic Stonehenge – a world heritage site.There are also a number of coach trips from Bath that take you there and back in a day. Here are a few things that we recommend.